This is fun and tasty and saves throwing away your potato peelings. I like to use any peelings I have as these cheeky little crisps and serve them up with ketchup and drinks before dinner. Just sprinkle with salt, pepper, chilli or whatever flavour takes your fancy and pop them in the oven or deep fry them to get most crispiness out them. So next time you find yourself with a mountain of Potato Peels, don’t think rubbish, think yummish….Ooo that was bad! Free crisps the kids will love! Wash and drain the peelings well and then dry the peelings by removing excess water with a tea towel. Add an inch or so of oil to a deep saucepan and heat to about 160C/325F, or until a small piece of peeling sizzles when added to the oil. (Caution: Do not leave hot oil unattended). Fry the potato peelings in small batches until crisp, golden-brown and crunchy. Drain well on kitchen paper and season with salt and pepper. 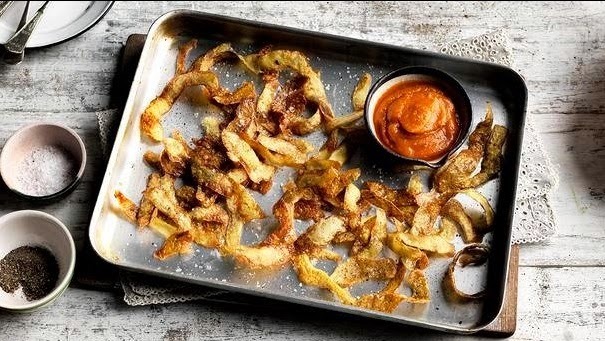 Serve the potato peelings with the squash ketchup for dipping and a little sprinkling of chilli powder or smoked paprika.